English at Sandvika: "Teachers should make it fun to learn." "Teachers should make it fun to learn." It is really important how much effort teachers put into motivating their pupils. I think teachers are in some way responsible of what their students are doing during the class. There are many ways to control them. 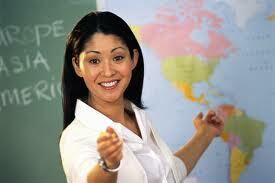 We have internet access all the time, but the teacher is able to confine the access. A great way of having fun at school is using internet properly. I think it's impossible to deny students using Facebook at school. As a teacher you can try out having one class where the students are responsible for their own assignments and they have deadline, if they are not done they get a lot of homework. I think it is really important to get used to ``freedom`` then you are prepared for the university. Teachers can make it fun at school, it is not that difficult. If there is only one thing a students needs it is varied classes. Not only reading books and answering some questions. There are so many profitable webpages a teacher can use in class. You can have a blog for your students, like we have or other things that make time go by at school where you are actually paying attention and do what you were asked about. You can also make your pupils decide what they want to do as long as they are using English. Once we had a competition where we were obligated to speak ONLY English for a whole day ( at school) After some minutes you got used to it and it was ok to speak without all the stress.. Sometimes it is really nice to make these kind of competitions at school. Everybody wants to win even though it is not that challenging. I think that's what is fun at school. When a teacher loves his job, and when he likes to work with children\teenagers. Not everybody is able to do that. That's why it is relevant who is becoming a teacher. It can really be boring when a teacher is just giving you some draggy homework while he is sitting in front of his PC and to be honest, is not interested in what we are actually doing. It's normal that we as students get bored and start doing things that we shouldn't . If you are a teacher and finds it difficult to find ways of make English class more interesting just look at the Competency goals and try to find a way to motivate students for reaching their goals.